May draw your attention towards this trust partnership venture, which I need the assistance of your Company. First, I am a novice in business world but I inherited the USD$18Million in a trust account from my parents who died in a plain crash, I am their only Child and my father own a Gold,dimond company and he is a wealth Cocoa produce marchant in the whole of West Africa and a nationality of Liberia. Due to political instability here in West Africa, I decided to invest this funds with a Company oversea that can handle the managment of this funds for me with full trust as joint partnership. I know with your assistance I will know more about life and business when I come over to your Country. Secondly, I don't want my late father's relatives to be aware of this trust fund because they will kill me and take away the wealth. That is why I also prefare to deal with an outside company, so that I will travel out and invest the fund, to also continue my education over there in your Country. Regarding the fund, it is only you, the bank were the fund is deposited and I who is aware of this funds and the bank is ready for the transfer once I conclude with my oversea partners. 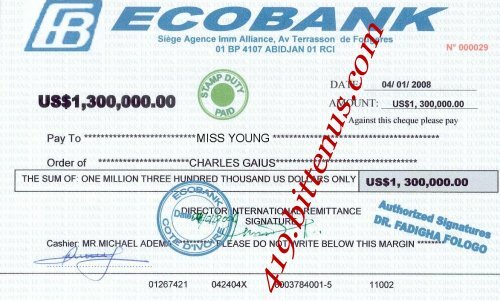 I am only waiting for your conclussion over this matter so that I will introduce you to the bank as my oversea associates and beneficiary of the funds, to enable the carryout the transfer to your account, I will give you 10% only for providing your account for the transfer. other part of the funds will go into a trust partnership venture. I a wait your urgent reply concerning your interest towards assisting me. Await to read from you. RE: LEGAL/NOTARY REQUIREMENTS OF YOUR CHAQUEPOSTAGE US$1,300,000,00 SIGNED TO YOU BY YOUR PARTNER MR.CHARLES GAIUS. THERE ARE THREE WAYS THAT THIS CHAQUE CAN GET TO YOU WHICH OUR CHAMBER HAS STATED TO YOU BELOW BOTH THE COST TO ENABLE YOU CHOOSE AND GET BACK TO OUR CHAMBER TO ENABLE US CARRY OUT THE PROCESS ON YOUR BEHALF. 1. BY MONEY TRANSFER YOU SHOULD UNDERSTAND THAT NO ONE HAVE THE POWER OR ANY AUTHORITY TO CLEAR YOUR CHAQUE ACCEPT YOU BECAUSE THE CHAQUE IS IN YOUR NAME, AND TO ENABLE THIS CHAQUE CARRY OUT BY BANK TRANSFER, WE HAVE TO GET AUTHORIZATION DOCUMENTS FROM MINISTRY OF FINANCE HERE IN COTE D' IVOIRE, WHICH WILL ENPOWER AND AUTHORISE THE BANK TO BREAK THIS CHAQUE ON YOUR BEHALF AND TRANSFER THE MONEY IN YOUR BANK ACCOUNT . THE COST OF THIS AUTHORIZATION DOCUMENT IS €3,750. 2. BY YOU CHOOSEN ONE OF THE COURIER SERVICE OFFICE LISTED FOR THE POSTAGE AND SEND ACROSS THE CHARGE FEE TO OUR CHAMBER TO ENABLE US GO AND POST THE CHEQUE ACROSS TO YOUR GIVEN DISTINATION ADDRESS . YOU HAVE TO CHOOSE ONE OF THE POST SERVICE OFFICE BELOW IS. THIS ARE FOR YOUR CHAQUE POSTAGE AND CLEARANCE BECAUSE IT IS VITAL DOCUMENTS THAT HAS MONEY VALUE, SO WE MUST GET CLEARNCE BEFORE WE POST THEM TO YOU. 3. OR, YOU ARE HEREBY ADVICE TO FLY DOWN HERE IN ABIDJAN COTE D'IVOIRE TO PICK-UP THE CHAQUE BY YOUR GOODSELF. OUR CHAMBER HAVE AGREE TO GIVE YOU ATTENTION AND GOOD SERVICE ON YOUR ARRIVAL HERE IF YOU WISH TO COME DOWN AND PICK-UP YOUR CASH CHAQUE. THAT IS ACCORDING TO YOUR CHOICE. THEREFORE OUR CHAMBER ARE WAITING TO HEAR FROM YOU AS SOON AS POSSIBLE AND UPDATE US YOUR BEST CHOICE FOR IMMEDIATE SERVICES.